Written by Nsenga K. Burton Ph.D.
By Nsenga K. Burton Ph.D. The State of Georgia’s Democratic Gubernatorial nominee has ended her historic run for governor in a controversial political race that has captured the attention of the country. In a press conference held today at 5 p.m. at her Kirkwood headquarters, Abrams acknowledged GOP candidate and former Secretary of State Brian Kemp will be Georgia’s next governor but failed to concede the race. “I will not concede because the erosion of our democracy is not right,” she stated. 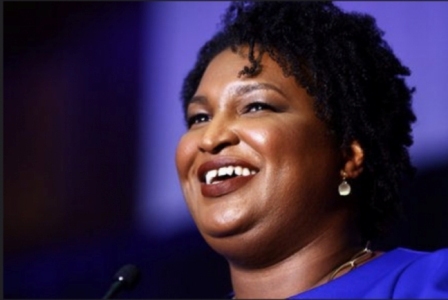 Abrams announcement comes days after post-election lawsuits demanding that all votes be counted in the face of voter suppression tactics used by the Secretary of State’s office. Kemp, who was the Republican candidate for governor, failed to step down from the office while running for office, which was a clear conflict of interest. During the campaign, it was reported Kemp’s office had removed 300,000 registered voters from the rolls in Georgia, 70 percent of which were voters of color. The Georgia legislature’s reinstatement of the exact match rule, which had previously been ruled unconstitutional in a previous lawsuit, resulted in the removal of voters from the rolls for missing a hyphen or leaving out a middle initial. A recent lawsuit found that those reasons could not be used to remove voters from the rolls or to discount provisional or absentee ballots. Kemp declared victory on election night, stepping down from office two days later to begin what he called his transition to the Governorship. Abrams refused to concede insisting all absentee and provisional votes should be counted, filing several lawsuits. The former Democratic leader of Georgia’s House of Representatives needed an additional 17,000 votes in order to force a run-off with Kemp but decided to end the election in order to work on reforming the voter registration and participation process in Georgia. In her speech, she criticized the voting process and the state of Georgia’s mismanagement of the gubernatorial election, saying she will be filing a major lawsuit against the state of Georgia for the “gross mismanagement of this election and to protect future elections from unconstitutional actions” in the coming days.